Being on Social networking sites and consistently updating on them sometimes become a tedious task. We all have observed that opening all of them at an instant is very difficult and we miss some or other fun often we go online. Rather a simple app like "Cortex" will take care of your presence on them instantly. Google now has an excellent add-on called 'Cortex' which will help you share videos, images, pages etc on those social sites such as Facebook, Twitter, Pinterest etc. Now no need to waste time on multiple site logins and opening pages all the time again and again. 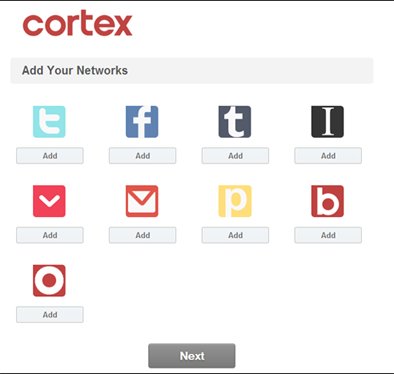 With Cortex you can share anything on social sites similarly you do them individually. Cortex supports a majority of them and can be linked easily once. Cortex can be installed on Google Chrome browser and it is very easy to use. All you need to do is to enter your individual account details once on the Cortex setup page and its done. You don't need any logins again to share your things. Just search for 'Cortex' App in Google Play store and click on add button. Once it is downloaded and installed on your chrome browser you are all set to use it.